Veterans face a special and unique set of circumstances that directly lead to and drive addiction to drugs and alcohol: the trauma they face during active military combat; the adjustment to being away from their families, loved ones, and support system; the post-service mental health issues they face; and the often negligent and insensitive treatment to which they’re subjected when they return home—all can make it extremely difficult to readjust, often causing them to self-medicate with drugs and alcohol. Data from the United States indicates that around 7.5 percent of Michigan adults are military veterans, and 54 percent of those veterans are age sixty-five and older. The specialized and specific nature of veterans’ substance use requires intuitive and comprehensive care. 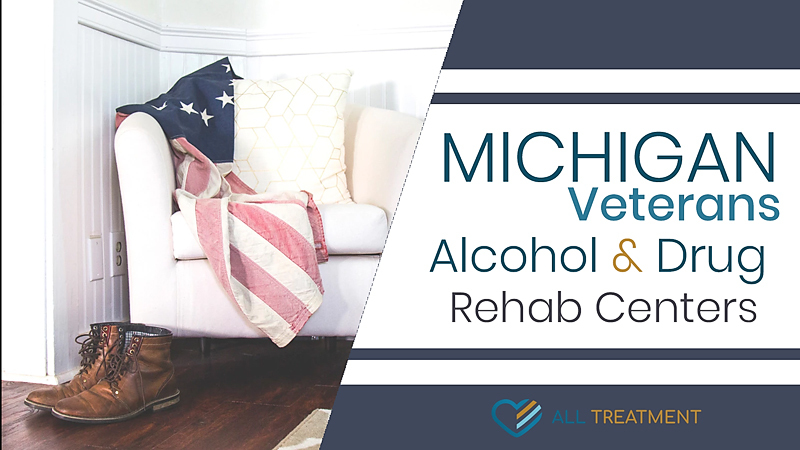 Multiple Michigan veterans alcohol and drug rehab centers address these factors, providing a full array of rehab services, including group therapy, individual counseling, trauma therapies, and more. Many of these programs also offer medication-assisted treatment (MAT) to help with combat-related opioid abuse, as well as logistical services like life-skills training and job-search assistance to help patients re-establish themselves and get back on their feet. Michigan’s thousands of addicted veterans need and deserve a lot of help. If you or someone you care about is a veteran living in Michigan in need of drug or alcohol rehab, start searching our database to discover your options.